Successfully Added 8GB MP4 + MP3 Player with FM Transmitter (3 Inch LCD) to your Shopping Cart. 8GB MP4 + MP3 Player with FM Transmitter (3 Inch LCD) for enjoying high quality video and audio in and out of the car! If you like to take your music and videos with you everywhere you go, then you will absolutely love this MP4 + MP3 Player. This MP4 + MP3 Player player supports a wide range of video formats with no conversion required, including Real Media (RM), RMVB, and MP4 files. 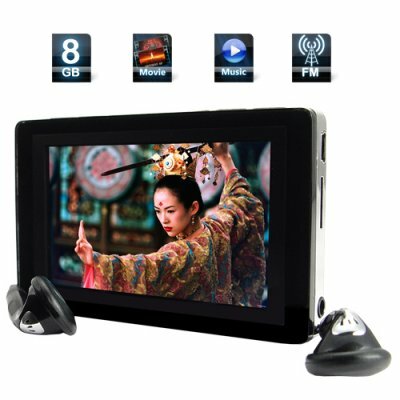 Enjoy your favorite movies, TV shows, and video clips on a 3 inch screen with seamless playback, clear images, and high quality picture. Stop wasting your time converting files and start enjoying your favorite videos. Absolutely no setup is required to use this MP4 + MP3 player in your car. Just choose an FM station to broadcast to, plug in the earphones to act as an antenna, and press play. That's it! You will love listening to all of your favorite tunes straight from your car speakers. With 8GB of internal memory and the ability to support a micro SD/TF card up to another 8GB, you'll have plenty of room to store all of your favorite videos and music. Easy to read menus and simple navigation let you can keep your hands on the wheel and your eyes on more important things, like the headlights of the hottie in the next lane. When you have to leave your car, the fun is just beginning! Just plug in the earphones and slip the MP4 + MP3 player into your pocket. A thin profile and long battery life let you enjoy your music and videos long after you leave the car. This MP4 player is perfect for watching videos when you're relaxing outside, eating lunch, taking a coffee break at work, or trying to stay awake during a boring meeting. This MP4 player's crystal clear display, smooth playback, and sharp image quality will keep you entertained and excited anywhere you go. If you are buying this MP4 player for your own enjoyment, you will love its wide range of supported file formats, large internal memory, and FM transmitter. If you are buying it to sell in your store or online shop, you will love the way it flies off the shelves. Order one sample today to see how good it really is, then order in bulk to enjoy even greater discounts. From your best source for high quality electronics, Chinavasion. Yes. You can listen to audio with the built-in speaker, through earphones, or through your car speakers. You can use the USB cable to load music from your computer directly on to the player. If you are using a micro SD/TF card, you can plug the card directly into the MP4 player. You can charge the MP4 through the USB cable, with the wall adapter, or the car cigarette adapter. An FM transmitter broadcasts the audio from your MP4 player to an FM frequency. Your car's FM radio (or any FM radio) tuned to the same frequency will play the audio from your MP4 player. Do I need to use the car adapter to use the FM transmitter? No, the car adapter is only for charging the MP4 player. The FM transmitter is built into the MP4 player. To use the FM transmitter, you must plug the earphones into the MP4 player. The earphones serve as an antenna for the FM transmitter. Does this unit play Apple MP4 files from the iTunes store? This product plays MPEG4 files like AVI, 3GP, etc. Apple's MP4 file format is a proprietary format. Thank you very much. Is very cool and very flexible product ;) It has everything I want. on 2010-07-10 17:00:27 Nice, great product! 8Gb is enough storage space and expandable with microSD. Fast delivery! Honestamente, el reproductor es mucho mas de lo que esperaba, me ha gustado mucho mas que un ipod, versatil, simple de manejar, de exelente calidad, reproduce todo lo que le pongo, videos, archivo .avi de alte resolucion, peliculas, todos los formatos de musica, definitivamente es mas de lo que anuncian, y la entrega increiblemente rapida, en 7 dias incluidos sabados y domingos, definitivamente equipo de chinavasion felicidades por tan exelente trabajo. on 2009-12-23 20:55:56 Best ever! Highly recomended. Many option lots of space and good quality!! !